Red Cat Press is an independent, Los Angeles-based publisher of satire zines and books. 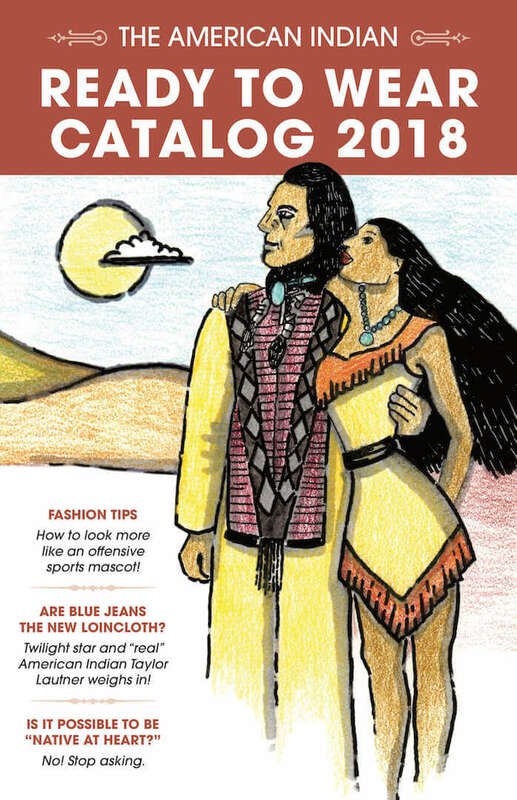 From Iron Eyes Cody to Native American sports mascots, The American Indian Ready to Wear Catalog is a 10-page mini-zine featuring all of the fashion tips you need to be the only type of American Indian that white society will allow you to be: a racist caricature. Joey Clift is a writer from Marysville, WA, who currently writes for UCB and DreamWorksTV. He has previously written for Nerdist, Warner Brothers Animation, Cartoon Network, Cracked.com, Defy Media, SyFy, and Nat Geo Wild, among other places. He’s a registered member of the Cowlitz Indian Tribe, and he thinks cats are just the best. Read more of his writing here. Janet Myer is a professional artist, illustrator, and teacher from Onalaska, WA. She graduated from of the University of Puget Sound School of Fine Art, and her portfolio includes freelance and graphic work, as well as book illustration, commercial art, and theatre backdrop painting. She’s a registered member of the Cowlitz Indian Tribe, and she’s also Joey’s mom. See more of her work here. If you want to stock us in your shop, contact us below! © 2019 Red Cat Press.